In the following article, Obelit Yadgar summarizes better than everyone else, the vision behind our Mesopotamian Night project. We are glad, he is back contributing to what he has passion for: promoting Assyrian Performing Arts. I have been part of Mesopotamian Night productions, in one way or another, since 2008. For 2008, 2009 and 2010 I was master of ceremonies, as well as writer, program annotator and on-camera interviewer. I flew in from my home in Wisconsin to do the stage work and the interviews. The writing was done at home. With the 2013 production approaching in June, as I plan a series of articles and interviews on the evening, I can’t help but reflect on those years with Mesopotamian Nights. Assyrian history is rich in art and culture. Visit the world’s finest museums and see our treasures. Yet to my dismay our performing arts suffer painful neglect, especially at a time when opportunity abounds to soar. Look at what other nations do. Feel the dedication to their arts. I wish the Assyrians would realize the wealth of their performing arts and embrace them heart and soul. For a nation’s soul is in its arts. It’s bad enough that half the world thinks we’re extinct, but it’s tragic to witness our timid exploration of the Assyrian performing arts. It’s as if we had none. Sure, our dances are danced at weddings and picnics and our popular songs are sung at various social gatherings. But there is more to Assyrian performing arts than these sweet pleasantries. The potential for great dramas, comedies, operas, light musicals, ballets and literary readings lies parched in an arid wasteland of neglect. We have the playwrights, the composers, the choreographers, the dancers and the poets. Look around you. They’re everywhere. Yet we taste meager servings. A few bones tossed out. How sad. What is needed is the willing heart and the generous purse to light up the Assyrian performance stage, for we can dazzle the world audience just as well as anybody. Once upon a time we dazzled the known world. That is what drew me to Mesopotamian Nights when asked, in 2008, to serve as master of ceremonies and writer. For me, it was a dream come true to experience an actual Assyrian stage production and then imagine the potential for some really big stuff. Despite suffering growing pains, artistically and in general, the productions made an indelible impression on the audience. Assyrians were witnessing something rare. I remember the Assyrian National Anthem “Roomrama” gave me goose bumps, in the 2008 production. William Daniel’s song “Nineveh” performed by soprano Lorraine Davis was a treat. And I feasted on the excerpts from the Assyrian operas Gilgamesh and Inanna, composed by John Craton. In the second half the pop singers Walter Aziz and Ashur Betargis, in the masterful hands of Music Director Pierre Noghli, rocked the evening to a memorable close. In 2009, John Craton’s opera Gilgamesh returned with another excerpt. Excerpts from the opera Qateeni by Michel Bosc, which was based on the Epic of Qateeni Gabbara by the noted Assyrian composer William Daniel, added to the operatic feast. Also by Bosc, Assyryt Suite was a tasty orchestration of 20 piano pieces by another renowned Assyrian composer Paulus Khofri. The Overture from the Oratorio Gilgamesh by Samuel Khangaldy stole the show. I was not familiar with the Rev. Khangaldy’s music. What an introduction to this fine Assyrian composer. The gorgeous overture, some 15 minutes or so in length, uses long and luscious lines in the tradition of the great symphonic poems by Tchaikovsky, Smetana, Liszt and Sibelius. Pop singers Lida Lawando and Emanouel Bet-Younan closed the second half with a string of Assyrian songs, from soulful to bouncy. The 2010, Mesopotamian Nights served a rollicking Broadway-style Assyrian production. Oh, it was a joyous evening, with a big orchestra, singers and dancers. Michel Bosc’s Assyryt Suite made a return. Then something new by the French composer: the cantata Ninos and Sermiramis, a love story set to poems by Yosip Bet Yosip. The Assyrian composer Sam Madoo showcased his arrangement for string quartet of several songs by William Daniel. George Somi, another young and talented Assyrian classical music composer, offered excerpts from his orchestral suite The Assyrian Legacy. Such impressive Assyrian talent. In the second half, Walter Aziz and musician and arranger Edwin Elieh collaborated on a memorable song and dance review. Sherene Melania, artistic director and choreographer for the Presidio Dance Theatre, spiked the show with her exciting choreography and corps of dancers in dazzling Assyrian costumes. Perched on a stool off stage, beaming like a child in a candy store, I could not but think that Ashurbanipal would have been pleased. Indeed, it was a memorable evening. Yes, the talent is there — and it’s rich. So is the subject matter. All that is needed is the willing spirit to help it soar. Mesopotamian Nights does it with its annual productions that celebrate the feast of the Assyrian Performing arts. Here is to many more years. At last years Mesopotamian Night, singer Rita Toma Davoud was a surprising pick to perform at the event since she was not as known or established as the other singers. However, our beloved singer Walter Aziz, knew something that many of us didn't and he picked her alongside four other singers. Man oh man what a great choice that was. Rita was well prepared and performed flawlessly. When Walter asked her on the stage on who was her singing inspiration when she was growing up, Rita told the audience that she admires many famous Assyrian singers but the one that gets her highest regards would be the late Shamiram Urshan. Ironically, We've decided to honor the great legend this year so we were delighted to invite Rita back again to perform the songs of her childhood idol at the 6th Annual Mesopotamian Night on June 15, 2013 at the California Theatre in San Jose, CA. Rita was born in Duhok, Iraq, however her family decided to leave the country and head to Turkey when she was at a young age of four. In 1998, the family was yet taking another journey, making Michigan its new home. At an early age, Rita discovered her passion for singing, and thus would perform on occasions for family and friends. 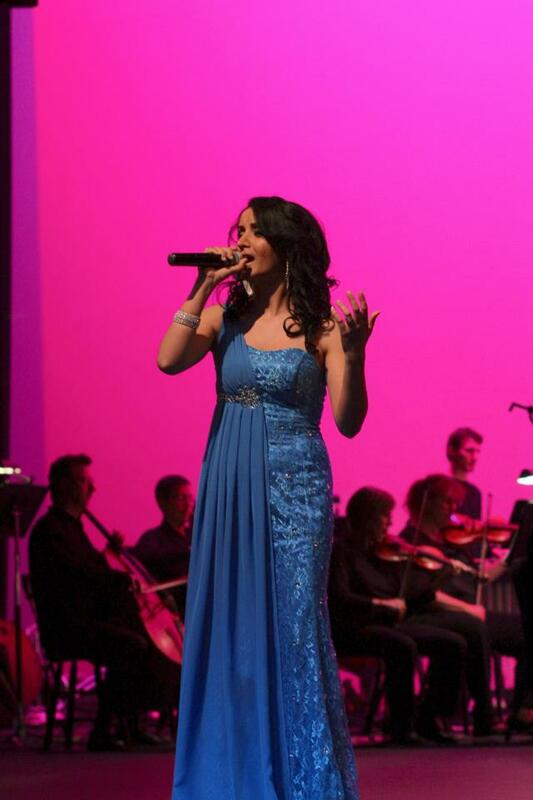 The year 2006 marked the most defining moment of Rita’s life when she participated in the first ever "Assyrian Superstar," an "American Idol"-like competition held in Chicago. That was when music enthusiasts discovered her charming voice, earning the highest praise from the judges and the loudest support from the audience, so it was only natural to crown her as the first ever winner of that competition. At the award ceremony, Rita was so thrilled and at the same time humbled when she told the crowd "Oh, my God, it was unbelievable. It has always been my dream to become a singing star, and in that moment, my dream came true." Rita’s good fortunes continued, during a visit to Australia in 2011, the famous Assyrian film movie Director, John Homeh, offered her to record a video clip from her album for the song “Shmi Jwanqa.” However, the most cherished experience in Rita’s singing career came when musical giant Walter Aziz contacted her to take center stage at the “Mesopotamian Night,” an Assyrian Aid Society of America project. The rare and historical project was going on its fifth year and has been attracting the attention of many artists, musicians and audience; a challenging setting for a singer to perform live with a 50-piece orchestra. Rita’s task was to perform three newly orchestrated classical Assyrian songs from the seventies of the legendary composer Vania David and lyricist Misha Ashoorian. Four singers alongside Rita have performed superbly to the sold out crowd and made it a night that would be remembered for ages. Aside from all the musical success, Rita also made time to start a family and an accomplished professional career. In 2007, she happily wedded Mr. Fadi AlBazi and together they began a life journey in the valley of the sun - Arizona. Soon thereafter, they were blessed with two children, Emma and Emmanuel. Most recently, Rita has joined the medical profession, as a Dental Hygienist and is only one year short of earning her diploma in Dentistry. We congratulate Rita and wish her much success in her future endeavors. Written by: Sargon Alkurge for mesopotamian-night.org - 2/12/2013. With a great pleasure and honor we introduce our beloved singer George Gindo to perform the songs of the legendary Edward Yousif "King Biba" at the upcoming 6th Annual Mesopotamian Night concert on June 15, 2013 at California Theatre in San Jose, CA. Born in Kirkuk, Iraq to parent Nanno Gindo and Elishwa Youkhana, has five sisters and two brothers. Married to Susan Gindo and have three children Ariana, Taymen and Assyria. As a youngster, he was inspired by his oldest brother Ninos who was an artist and a musician. Soon he was singing at gathering of friends and relatives who were very supportive of his abilities. Like many Assyrians, George left his birth country and migrated to the United States in 1979. He settled in Chicago, IL and made it his home since. In mid 1980s, he started singing at friends and relatives private parties joining other singers. The turning point in George’s career happened in 1989 when he formed the Chemou Band and started to perform at the Assyrian American Association Club indoor picnics and parties. 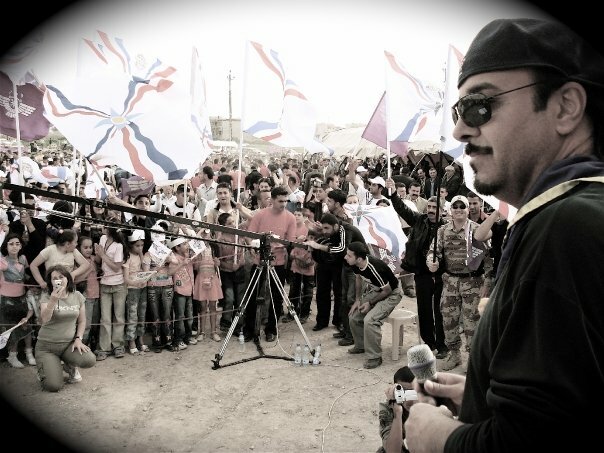 Shortly thereafter, George started to get the attention and praise from the Assyrian community and his songs became popular among Assyrian music fans nationwide. George first album (cassette) “Khoolma” was released in 1992 containing seven original songs and one instrumental. Also, a video clip of the album hit song (kha b’ Nissan) was created by the Assyrian Around the World network. Two albums (CDs) were followed, “George Gindo 2003” and “Khoba Khaya” in 2006. There were also three video clips produced from the 2006 album, in which one of them was filmed in our homeland, Bet Nahrain. Currently, George is finalizing his fourth album and it's due to be released in spring 2013 along with selected video clips. The most cherished experience for George happened in 2007, when he was asked to join a group of very talented Assyrian singers and musicians to participate in Akitu: The Assyrian-Babylonian New Year celebration held in the homeland Bet Nahrain. Returning to the land of our ancestries after 28 years and performing in front of our people was a memory to last a lifetime. It was astounding to witness the accomplishments of our people back home even with all the struggles. To be able to brace their roots deep in their land was truly extraordinary; especially with all the obstacles in their way. They kept the persistence and moving forward. Most of those accomplishments were possible because of the support that they received from the Assyrian Aid Society abroad. That was what George heard from many community leaders and ordinary people. George doesn't consider singing a business, but more as a message to the present and future generations. Nevertheless, we all need to appreciate our songs and to value its art. As many would agree, nations are regarded in many ways by the level of music they pile.